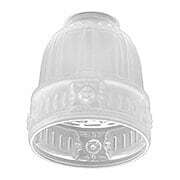 Recalling the early 20th century, this classic Sheffield-style shade adds character to new and vintage fixtures alike. 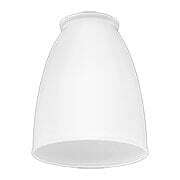 Made of etched glass, it features a sandblasted interior to soften glare, and a glossy outer finish. With flowing lines and characteristic shell-like ribbed surface, it works well in a variety of period-inspired homes. 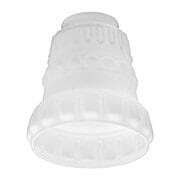 Recalling the early 20th century, this classic Sheffield-style shade adds character to new and vintage fixtures alike. 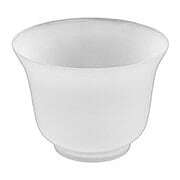 Made of satin-opal glass, its smooth, opaque surface softens glare for glowing light. 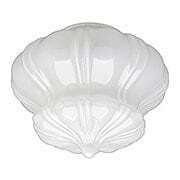 With flowing lines and characteristic shell-like ribbed surface, it works well in a variety of period-inspired homes. 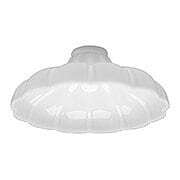 Made from hand-blown, satin-opal glass, our Classic Satin-Opal Pan Light Shade with 2 1/4-Inch Fitter features classic, raised patterns on its smooth surface. 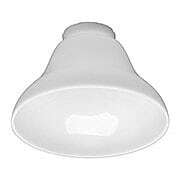 Whether you are outfitting a new or vintage fixture, it is typically suited for chandeliers, pan lights or shower fixtures. 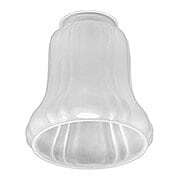 The Classic Opal Bell-Shaped Shade (2 1/4-Inch Fitter) has been a favorite since the Victorian era, but is equally at home with Mid-Century or modern decor. 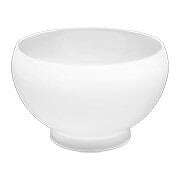 Made in the USA, it's hand-blown in glossy opal glass to soften glare. 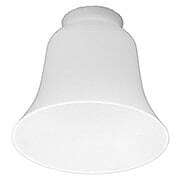 Whether you're outfitting a new or vintage fixture, its suited for sconces, pendants, and chandeliers alike. Recalling the early 20th century, this rare, acorn shaped Sheffield-style shade adds character to new and vintage fixtures alike. 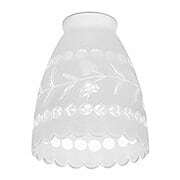 Made of etched glass, it features a sandblasted interior to soften glare, and a glossy outer finish. With flowing lines and characteristic shell-like ribbed surface, it's suited for chandeliers, pendants, or wall sconces in a variety of period-inspired homes. 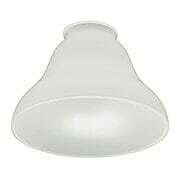 Recalling the early 20th century, this classic 7 1/8-Inch Diameter Glossy Opal Sheffield-Style Shade (2 1/4-Inch Fitter) adds character to new and vintage fixtures alike. 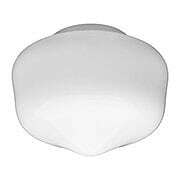 Hand-blown in the USA of opal glass, its smooth, opaque surface softens glare for glowing illumination. 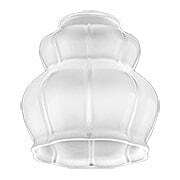 With flowing lines and characteristic shell-like ribbed surface, it is suited for chandeliers, pendants, or wall sconces in a variety of period-inspired homes. 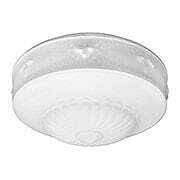 Recalling the early 20th century, this classic 9-Inch Diameter Glossy Opal Sheffield-Style Shade (2 1/4-Inch Fitter) adds character to new and vintage fixtures alike. 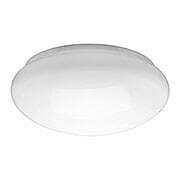 Hand-blown in the USA of opal glass, its smooth, opaque surface softens glare for glowing illumination. With flowing lines and characteristic shell-like ribbed surface, it is suited for chandeliers, pendants, or wall sconces in a variety of period-inspired homes. 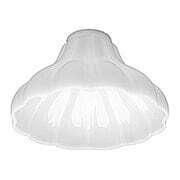 The Classic Opal-Glass Shade (2 1/4-Inch Fitter) has been a favorite since the Victorian era, but is equally at home with Mid-Century or modern decor. 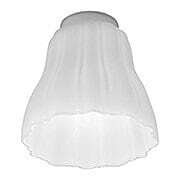 Made in the USA, it's hand-blown in glossy opal glass to soften glare. Whether you're outfitting a new or vintage fixture, its suited for sconces, pendants, and chandeliers alike. Recalling the early 20th century, this rare, squash shaped Sheffield-style shade adds character to new and vintage fixtures alike. 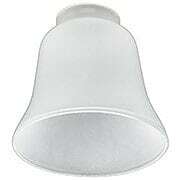 Made of etched glass, it features a sandblasted interior to soften glare, and a glossy outer finish. With flowing lines and characteristic shell-like ribbed surface, it's suited for chandeliers, pendants, or wall sconces in a variety of period-inspired homes.